ALLEGRA BOVERMAN/Staff photo. Gloucester Daily Times. 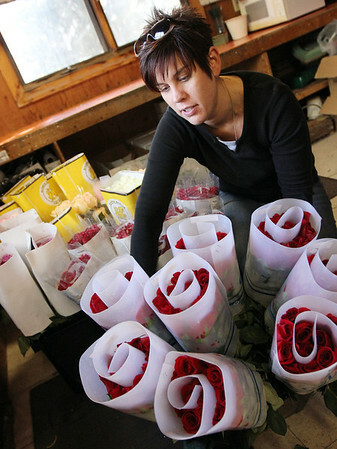 Gloucester: Heather Peterson, owner of Audrey's Flower Shop in Gloucester, is readying for the Valentine's Day rush. They received two shipments each of 1,500 roses on Friday and Saturday and were preparing the blooms for the creation of bouquets. They get a long line of customers on Tuesday for flowers, and some, she said, like to create their own floral arrangements with blooms of their choice from around the shop. The store typically sells 3,000 per Valentine's Day. They are also partnering with Just Nails by Nicki of Gloucester for gift certificates to add to the bouquets.